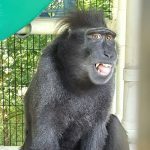 The crested black macaque, also known as the Celebes ape and, more commonly, as the Sulawesi macaque, is an Old World monkey found on a group of Indonesian islands, including the large island of Sulawesi (formerly known as Celebes). These black-haired, very-short-tailed omnivores, who are particularly fond of fruit, will grow to about 22 inches, although they may look a bit taller thanks to their most distinguishing feature: a crest of long, coarse hairs atop their heads that resemble Mohawk hairdos. In the wild, where their native habitat is largely mountains or tropical rainforest, Sulawesi macaques may travel in groups of 50 or more. But there’s not necessarily strength in numbers: their babies are sometimes stolen for the pet trade, they’re hunted for food and killed for making off with farmers’ crops, and humans are encroaching so rapidly upon their natural range that they’ve been designated an endangered species. 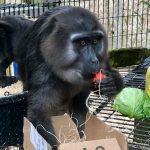 Mandy is a former pet from Missouri whose owners realized her need for companionship with other monkeys in a more suitable living environment. Maggie is a former pet from Missouri (a state with virtually no restrictions on ownership of exotic animals); outgrew her welcome upon reaching adolescence.